Classic Instruments' new digital speedometer cluster for the Early Ford Broncos offers all new styling with 5 different color/face options. This all-electric unit eliminates the 50-year old factory analog technology to provide much more accurate readings. It also eliminates the factory amperage gauge and replaces it with a much more useful voltage gauge. Finally, this unit also includes a tachometer at the top of the cluster, something the factory cluster failed to provide. 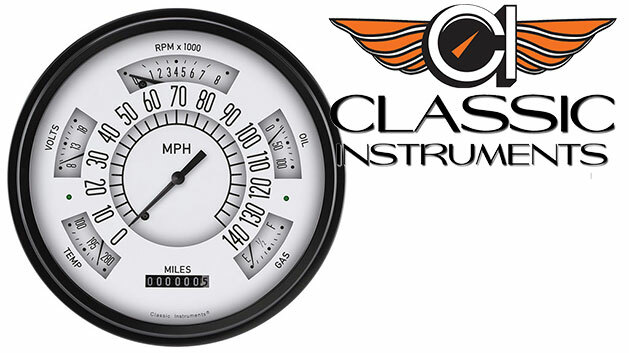 The Classic Instruments Bronco Gauge Cluster is a direct fit replacement for your original cluster and includes mounting hardware and all necessary gauge sending units. NOTE: Exclusively for Tom's Bronco Parts, the fuel gauge in this unit is made to accept the factory ohm range. This eliminates the need for a custom fuel sending unit used by other Classic Instruments retailers for an easier install with zero modification.